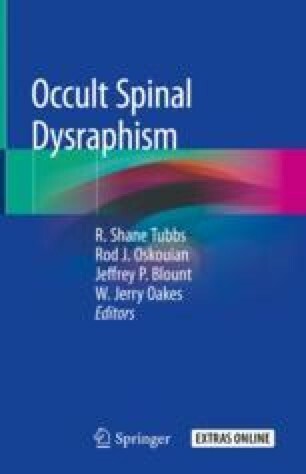 Tethering tracts from the skin that travel toward the spine, dermal sinus tracts, are categorized within the spectrum of occult spinal dysraphism. Infected tracts or those associated with deeper lying dermoids can be difficult to diagnose due to their size. Although most are lumbosacral in location, these can run anywhere along the midline. The physician should suspect and rule out a dermal sinus tract in patients with recurrent meningitis without other clear causes. Treatment of DST with complete surgical excision is the standard of care and is associated with excellent outcomes particularly if undertaken early in the life of the patient.